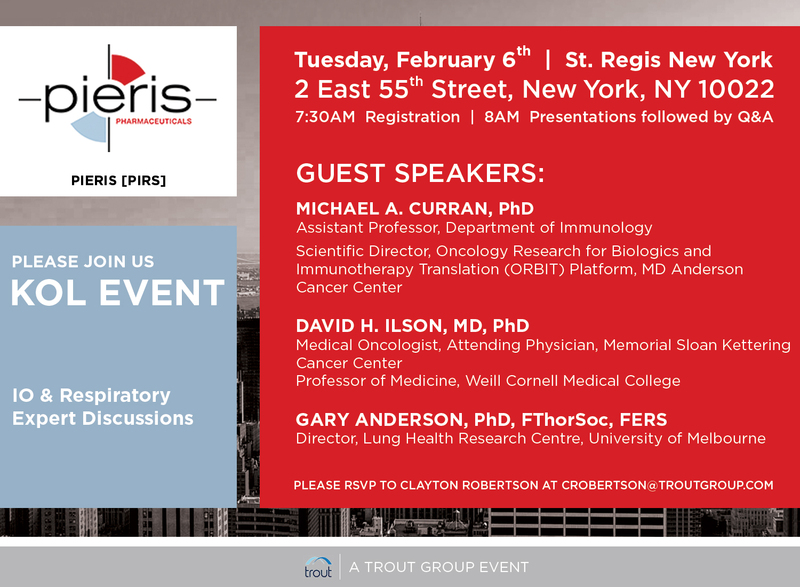 Please join Pieris management & Experts in NYC on Tuesday February 6th for their KOL Breakfast focused on I-O & Respiratory. 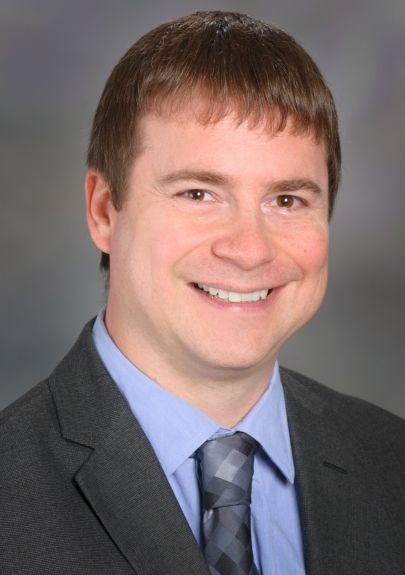 Dr. Michael Curran is an Assistant Professor in the Department of Immunology and Scientific Director of the Oncology Research for Biologics and Immunotherapy Translation (ORBIT) platform at MD Anderson Cancer Center. During his postdoctoral work in the lab of Dr. James Allison, Dr. Curran performed animal studies characterizing the effect of checkpoint inhibitor blockade on cancer progression that led to clinical trials for the first checkpoint inhibitor antibody combination treatment approved by the FDA. Despite the potential for antibody-mediated immunotherapy to provide complete remissions to patients with advanced metastatic disease, the vast majority of human cancers remain resistant. Since starting his lab in 2012, Dr. Curran has been focused on realizing the full potential of cancer immunotherapy. Using studies of murine tumor models resistant to current immunotherapies, such as anti-CTLA4 and ant-PD-1, and samples from patients treated at MD Anderson, he is exploring the mechanisms by which tumors evade immune rejection in order to find new targets for immune therapy and looking for markers to identify the patients most likely to benefit from currently available T-cell directed immune therapies. Ultimately, he hopes to greatly expand the options for immune therapy to cure a larger number of patients and attack a wider range of cancers. Dr. Curran’s studies of 4-1BB agonist antibodies won him the Society for the Immunotherapy of Cancer’s prestigious Presidential Award. 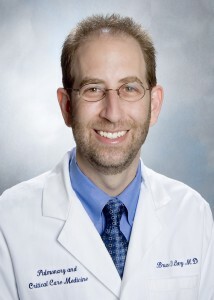 David H. Ilson, MD, PhD is an attending physician and member at Memorial Sloan Kettering Hospital in New York and a professor of medicine at Weill Cornell Medical College. He is a nationally recognized authority in the treatment of gastrointestinal cancer whose primary area of research interest involves upper gastrointestinal cancer, with a special focus on esophageal cancer. Much of his research has focused on the study of new agents in advanced esophageal cancer and the evaluation of novel agents in combined-modality therapy programs in locally advanced disease. Dr. Ilson's other areas of clinical expertise include gastric, colorectal, esophageal, pancreatic, and other gastrointestinal cancers. Dr. Ilson sits on the gastrointestinal committees of Cancer and Leukemia Group B (CALGB), the Radiation Therapy Oncology Group (RTOG), and the Upper GI Cancer Guidelines Committee of the National Comprehensive Cancer Network (NCCN). He is chairman of the Intergroup Esophageal and Gastric Cancer Task Force Committee. Currently, Dr. Ilson also chairs or co-chairs several national clinical trials in esophageal cancer, including RTOG 0436, which is evaluating in a phase III trial of the addition of cetuximab to definitive chemoradiotherapy in locally advanced esophageal cancer. Dr. Ilson completed undergraduate training at the University of Connecticut. He entered an MD/PhD combined degree program at New York University where he received a Masters and PhD degree in Basic Science and his MD Degree. He completed his internship and residency in internal medicine at Bellevue Hospital at NYU in New York. He then moved to Memorial Sloan-Kettering Cancer Center and completed a fellowship in medical oncology and hematology, including a third year fellowship as the Brian Piccolo research fellow. 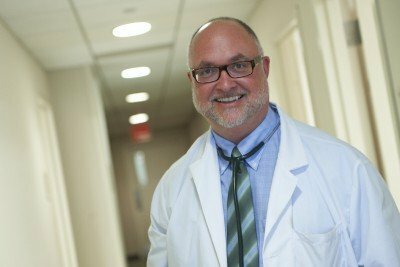 He joined the staff at MSKCC in 1992, becoming a member of the GI Oncology Service in the Department of Medicine, under the direction of Dr. David Kelsen. Dr. Ilson has been honored as a recipient of the American Cancer Society Career Development Award. 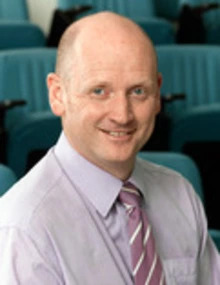 Gary Anderson is a pharmacologist and immunologist based in the Medical Faculty at the University of Melbourne, Australia, one of the world’s leading research-intensive Universities and Medical Schools (www.unimelb.edu.au) where he is a tenured Professor and Director of the Centre for Lung Health Research. Gary’s own research has centered on using genetic disease models to understanding molecular mechanisms of disease induction, progression, severity and exacerbation in asthma and COPD. He co-discovered the role of Fas in lung inflammation, IL-4 in immune biasing in asthma models and the bronchoprotective PAR receptor system in the airway epithelium. Recent research has explored how blood growth factors control innate immunity in asthma and COPD; IL-17 in persistent inflammation; linking mutations in src-kinases to non-T cell determinants of very severe lung disease; plasticity and heterogeneity of lung macrophage progenitors; novel blood biomarkers in COPD exacerbations; molecular determinants of muscle wasting in COPD, GM-CSF as a therapeutic target; genetic reprogramming of lung stem cells and the molecular co-determinants of emphysema and lung cancer; and, the role of SAA in lung inflammation and allosteric block of catabasis. In 2008 he proposed the widely cited endotype (http://en.wikipedia.org/wiki/Endotype) concept of asthma (Lancet). He works closely with clinical colleagues in Melbourne’s preeminent Hospitals, especially the Departments of Respiratory Medicine and Clinical Immunology at the Royal Melbourne Hospital (www.rmh.mh.org.au ), on translational lung disease research. He is the author of more than 150 highly cited manuscripts on lung disease research and is a recipient of the Research Medal of the Thoracic Society of Australia and New Zealand (TSANZ) for his contribution to lung disease research. Prior to returning in Australia Gary worked in the Swiss Pharmaceuticals Industry (Sandoz and Ciba-Geigy, now Novartis) for about 10 years and he maintains close links with biotechnology and pharmaceutical companies interested in advance lung health. His basic and applied translational work has contributed to the discovery and development of number of new medicines for respiratory disease that are widely used in current clinical practice. He co-founded, and served as Research Director of, the Cooperative Research Centre for Chronic Inflammatory Diseases (CRC-CID), and has served at executive level on the National Health and Medical Research Council (NHMRC) of Australia. He serves on the Board of Directors of TSANZ, where he is Chair of the Research Committee, and on the Council of the Lung Foundation Australian.